Chocolate Marshmallows - Chocolate Chocolate and More! Light, fluffy chocolate marshmallows are a fun snack or a way to add a little more chocolate to your hot chocolate. Thank goodness they’re easy to make because my kids gobble these up. I went on a marshmallow making binge when Becks was home for Christmas. It was cold and rainy so she and her boyfriend were drinking a lot of hot chocolate – I mean a lot! Now I love hot chocolate on a cold day but sometimes you just need to dress it up a bit. I started with homemade vanilla marshmallows. The recipe is the same as these except omit the cocoa and add 1 more teaspoon vanilla. Then my neighbors pointed out that a local ice-cream shop sells flavored marshmallows so I decided to try some different flavors. 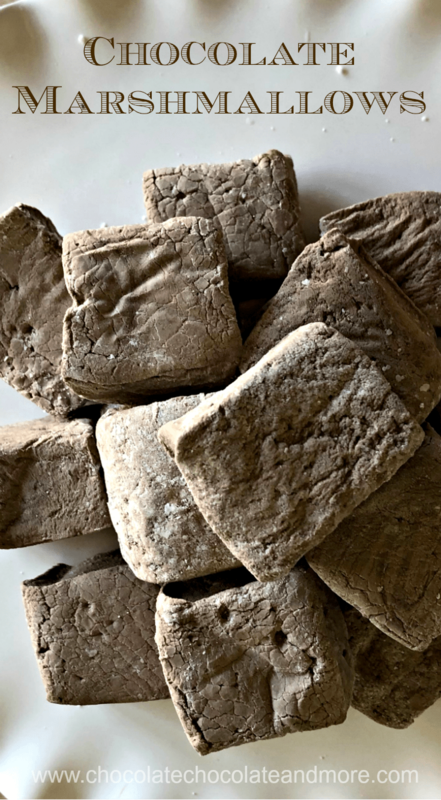 I made coffee, peppermint stick and these chocolate marshmallows. Chocolate marshmallows add extra chocolate creaminess to hot chocolate. And they are fun to eat with either the coffee or peppermint stick marshmallows. Put gelatin, cocoa, and warm water in the bowl of a stand mixer with a whisk attachment. Let sit while you make the sugar syrup. Then turn your mixer on high. You will beat the gelatin until it's just slightly hot (you can put the back of your hand on the bowl). Add the vanilla extract and beat in. Place the remaining powdered sugar mixture in a bowl and coat each marshmallow with it. Shake off the excess. Store in an airtight container for up to 3 weeks. Nutrition information is provided as a guideline only. Please consult a dietitian if you have specific dietary requirements. 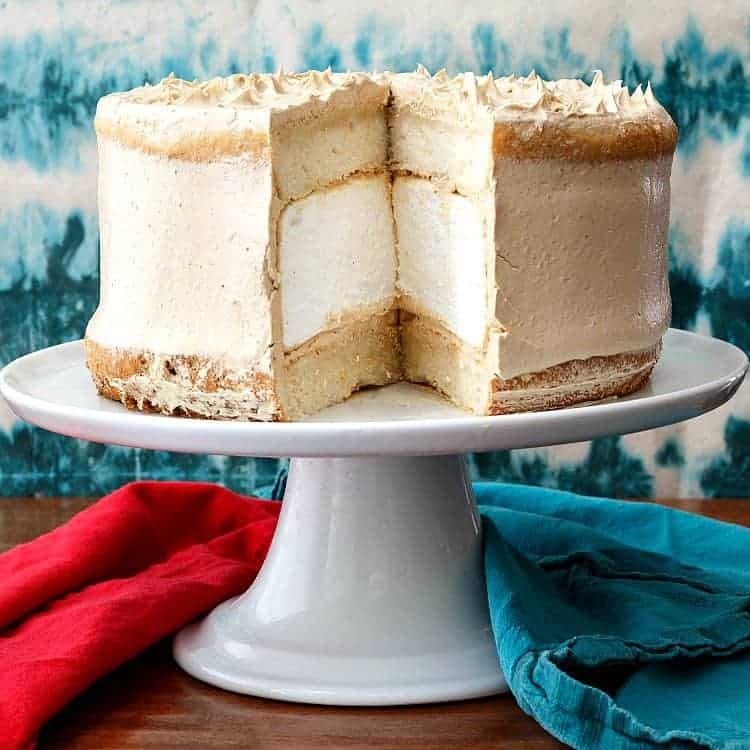 You could also use this recipe in Jenni Field’s Peanut Butter Marshmallow cake. Thanks Fiona! I hope you enjoy them! 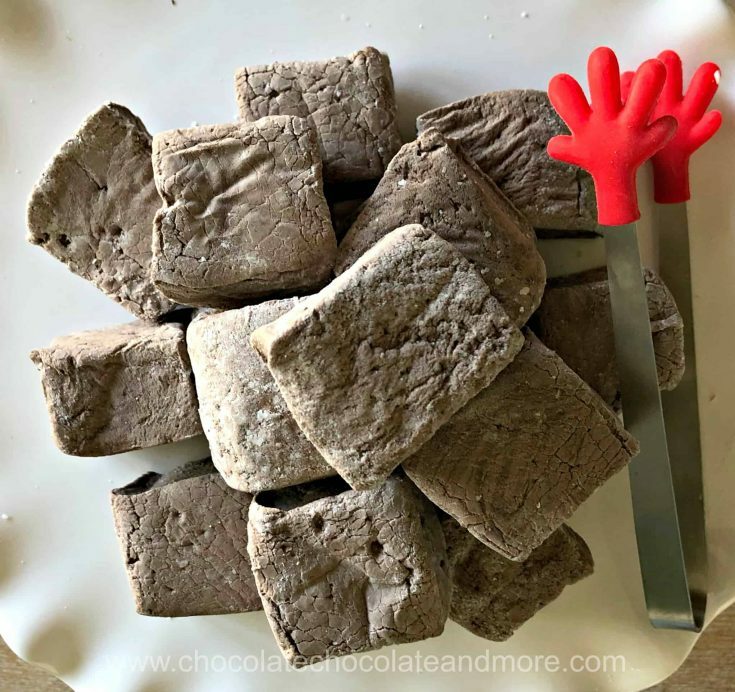 Wow, chocolate chili marshmallows sound amazing! I never tried this recipe before and after reading this amazing post I think I must give it a try. I hope I will make them like you. Thanks Roslia. I hope you enjoy them as much as we did!